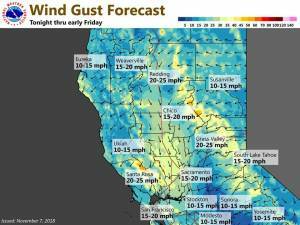 November 7, 2018 – Dry weather continues with periods of breezy north to east wind thru Friday morning leading to critical fire weather conditions. 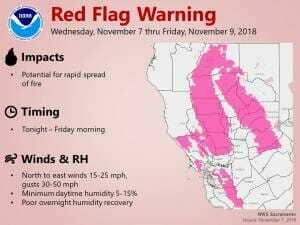 Red Flag Warning from 10 PM this evening to 7 AM PST Friday. Other than a few high clouds brushing across the region, skies are clear and winds are generally light. With the dry airmass in place, current temperatures are chilly ranging from the mid teens to mid 20s in the mountain valleys to the 40s to mid 50s across the Central Valley. Satellite imagery shows the next upstream short-wave over the PacNW early this morning. It will slide southeastward into the Great Basin and NorCal later today and tonight. North and east surface pressure gradients will increase later tonight in the wake of this feature. The result will be increasingly gusty northeasterly winds and lowering humidity across most of the region, and the red flag warning continues. The gusty winds will continue Thursday and Thursday night before subsiding early Friday as pressure gradients relax. High amplitude upper ridge over the west coast will keep NorCal dry with above normal temperatures through the extended period. Flow around this ridge will bring breezy north winds on Sunday but this wind will becoming relatively light Monday as the upper ridge axis shifts over the west coast. A Pacific frontal system flattens the west coast ridge around next Tuesday afternoon as it moves into the Pacific northwest. This will bring a little cooling and a slightly more onshore flow but otherwise have little impact. Temperatures warm slightly on Wednesday as upper ridge rebuilds. Winds are not expected to be especially strong during the extended period but RH values will be quite low each afternoon in the dry airmass with widespread humidity values in the teens each afternoon and only moderate morning recovery. Therefore fire danger will remain higher than normal for this time of year.